This project was a collaboration between Boris Gutkin, Sophie Denève and myself at the Group for Neural Theory (ENS, Paris) and Sicco de Knecht and Wytse Wadman at Cellular and Systems Neurobiology at the University of Amsterdam. Understanding the relation between (sensory) stimuli and the activity of neurons (i.e. 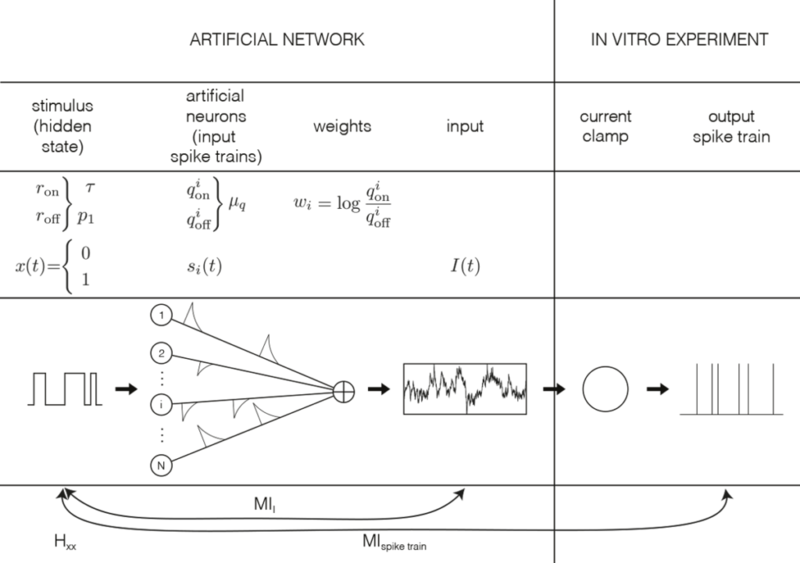 ‘the neural code’) lies at heart of understanding the computational properties of the brain. However, quantifying the information between a stimulus and a spike train has proven to be challenging. 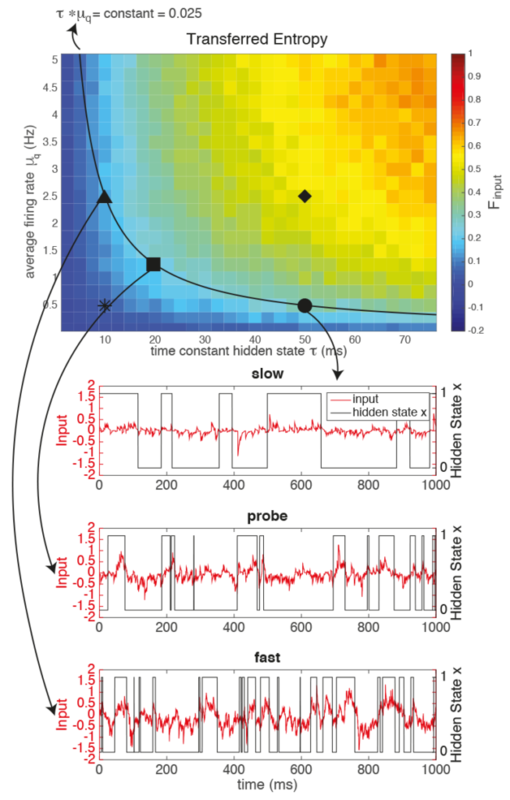 We propose a new (in vitro) method to measure how much information a single neuron transfers from the input it receives to its output spike train. The input is generated by an artificial neural network that responds to a randomly appearing and disappearing ‘sensory stimulus’: the hidden state. 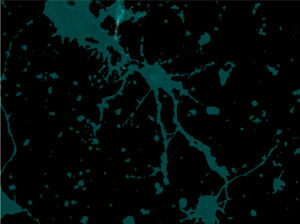 The sum of this network activity is injected as current input into the neuron under investigation. The mutual information between the hidden state on the one hand and spike trains of the artificial network or the recorded spike train on the other hand can easily be estimated due to the binary shape of the hidden state. The characteristics of the input current, such as the time constant as a result of the (dis)appearance rate of the hidden state or the amplitude of the input current (the firing frequency of the neurons in the artificial network), can independently be varied. As an example, we apply this method to pyramidal neurons in the CA1 of mouse hippocampi and compare the recorded spike trains to the optimal response of the ‘Bayesian neuron’ (BN). We conclude that like in the BN, information transfer in hippocampal pyramidal cells is non-linear and amplifying: the information loss between the artificial input and the output spike train is high if the input to the neuron (the firing of the artificial network) is not very informative about the hidden state. If the input to the neuron does contain a lot of information about the hidden state, the information loss is low. Moreover, neurons increase their firing rates in case the (dis)appearance rate is high, so that the (relative) amount of transferred information stays constant. Niccolò is developing a new method for analysing calcium imaging data, based on regression. This method promises to have a better spatial resolution than the standard used ‘Delta F / F’. Code will be shared soon!